Island Restaurant and Party Bar. Privately owned small chain of themed restaurants with an emphasis on Flair. The flag ship store is inside Treasure Island, Las Vegas , Nevada, USA and is home to the Skyy Vodka Flair bartending Extreme team God squad. 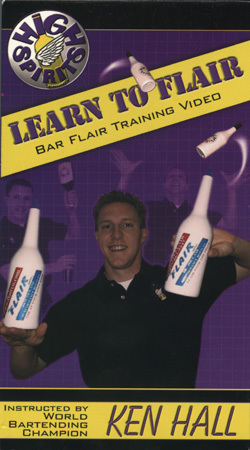 Ken Hall, a world champion bartender, starts his video with the basics in the introduction section. He stresses safety first then progresses into the beginners working Flair section, then advances into the harder intermediate section. Each section builds on the other, starting with the basics, a simple glass, and tin, and single bottle, progressing into the more complex exhibition Flair. In each segment, he performs a routine to make a drink, then step by step breaks it down into individual moves until the routine is complete. As the video progresses, the routines become more difficult, such as a single bottle and tin, or 2 bottles together. Throughout each section, Ken teaches us the proper grips, and hand positioning, as well as tips to ensure a safe and clean routine. He then moves to the competition level, where he again demonstrates, and breaks down each move individually, until you have a completed routine. In conclusion, this video will help the new comer as well as someone like myself that has been Flairing for a while. Not only does Ken teach us the moves, but he also organizes them into routines, showing how one move leads into another, until you have a completed routine. BUY IT HERE NOW! We discovered this frozen green delight while we were busy working hard down at Bartenders Bash, Islamorada. This drink is the perfect answer for that tropical beach or just watching the sun go down pool side. Enjoy! A Flair only competition organized by the Flair Devils. 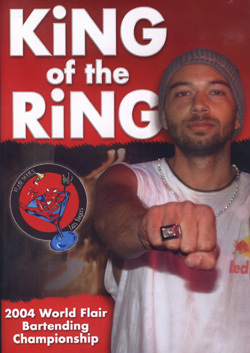 DVD Available for purchase.